Here’s my first alternative movie poster artwork, for the Matthew Holness short from 2011, A Gun For George. Having been so inspired by the revered commercial illustrators of the '60s, '70s & 80’s (Putzu, Amsel, Bysouth etc), specifically artists who rendered movie posters, I realised I’d never actually painted one, so recently revisited the rough design that I drew up for this a very long time ago. Very much channelling Arnaldo Putzu here. A limited run of prints of the poster are available to buy exclusively here - https://www.garymillsfineart.com/shop/a-gun-for-george-movie-poster, and if you've not seen A Gun For George, it's only 17 minutes long, it's available to view here - https://www.film4productions.com/shorts/gun-george and it’s brilliant. I guess A Gun For George may appear to some to be little more than another exercise in silly, retro-inspired gratification, a pretext to indulge in Sweeney-esque capers in a brown suit and outsize moustache behind the quartic wheel of an Allegro. Those unmoved by such confections will probably be turned off by their recognition of writer, director and star Holness as the titular all-action MD from the steeply styled comedy series Garth Marenghi’s Darkplace. You realise about halfway through however that A Gun For George is not played merely for laughs. Holness plays protagonist Terry Finch, a writer of unremittingly violent pulp paperbacks whose twin brother George is brutally murdered. Terry’s vengeance is played out via film trailer reveries, imagined celluloid adaptations of his books where the Kent underworld is made to pay via the barrel of a snub-nosed Revolver, wielded by Finch as star in a hallucinatory feature, “The Reprisalizer”. Among those in the firing line are not just George’s killers, but Finch’s publisher, who severs ties with Terry and his woefully outdated shtick at the film’s outset. With no takers for his books, and with only a dilapidated caravan and British Leyland’s most derided car to his name, Finch is not just down-on-his-luck, he’s as much of a loser as it’s possible to be. When his home is trashed by hoodlums, all he is left with are the Allegro - left to him by his brother and now named after him - and his crazed revenge fantasies. All grimness aside, it’s initially very funny as we’re encouraged to laugh at Finch’s struggles (his enfeebling threat on expulsion by a staff member from Westgate-On-Sea library is exquisite: “I’ll come for you woman, and when I do, I’ll re-arrange this library BY GENRE!”). But when his almost continual fever-daydreams of lurid and comically contrived vengeance are increasingly interrupted by the all-too-real (and similarly recurrent) flashbacks to his brother’s savage killing, you see how Finch’s Walter Mitty tendencies, and sense of personal loss & hardship add up to a man on the brink of complete disintegration. His barely concealed desire for rampage - played out as fiction in his trash novelettes - is on the verge of spilling over into reality at the film’s close. This conflict between humour and unease (the scenes depicting George’s murder are given a psycho-horror edge by some occasionally radiophonically-inspired sonics) is what I really like about A Gun For George. Holness has clearly been inspired by the great-though-ghastly ‘70s Brit flick The Offence, a frankly horrible but brilliantly played exploration of male aggression, augmented by damp Brutalist architecture and monstrous facial hair. Finch’s machismo however appears largely inert, beside a fixation on thugs being shot in the balls in the pages of his books. Beautifully delivered too is Holness’ keenness for self-parody: Finch’s pathetic situation, bedecked as it is in such determined nostalgia, mocks the derivation of Darkplace. And just as Matt Berry sends up his real-life voiceover work in Toast Of London, Holness - a long-time writer of short stories - deliberately reflects on his craft through both Marenghi and Finch. At the time of A Gun For George’s release, Holness extended further the layers of alt-realities dabbled with in the film with a superb online “Reprisalizer” presence, helmed supposedly by the founder and president of the Terry Finch Appreciation Society. Alas, it’s largely disappeared now, save for a blog and some brilliantly executed fake paperback pages - treat yourself to a search for them. One final thought: Terry Finch, appearing as he did five years ahead of the referendum, might just be the ultimate proto-Brexit man - obsessed with the past, full of directionless, eye-popping fury at perceived injustices and bereaved by both George and his own obsolete masculinity. Terry’s nowhere near as well-adjusted as Paul Kersey, and you can’t help feeling he’d take us all to hell with him. Similarly of-the-moment is Holness’ feature debut, a full-tilt horror called Possum which has garnered rave reviews, though I’ve yet to see it. Every reason to suggest - on the evidence of A Gun For George - that he knows what he’s doing. A neat follow-on from the last post here - my Ingrid Bergman painting (or more accurately, a print of it) is presently part of Sarah Taylor Silverwood’s Crowd Show at NN Contemporary here in Northampton. Sarah’s random curation method - an open call via a roadside billboard - has facilitated a disparate collection of artworks for the exhibition, intended as the starting point for a series of events in the town which will address the meaning and value of art and the art world. It’s a pleasure to be involved, and you can drop in to see the exhibition until the 3rd of November. More info on Crowd Show and details on the public programme of events can be seen here. Incidentally, the original painting is currently up for sale here at a ludicrously low price…. My Liz Taylor, Richard Burton, Cary Grant & Ingrid Bergman original paintings are all available to purchase now from those estimable merchants at 15 Collingwood as part of their summer art show (amongst some fine local talent). It's an essential Northampton stop-off for those of the shrewdest taste - many thanks once more to Rocco & co. Delighted to share another YouTuber commission - this time for Louis Cole's 'Fun For Louis' project. Louis is a travel vlogger who's been documenting his adventures around the world for several years now, and his photography provided me with some stunning references for this social channel banner illustration. The 'Fun For Louis' YouTube home page, with banner artwork in situ. You can check his YouTube here https://www.youtube.com/user/FunForLouis. Why not drop him some feedback on the artwork too, maybe help him over that tricky 2m subscribers hurdle....?! If you like what you see on this site and are looking for a unique gift to send this Christmas, now would be a superb time to commission a portrait. I'm offering 20% off the regular price of any portrait (based on the guide prices here) from now until Friday 1st December. All you have to do is interact with the relevant social media posts - across my Facebook, Twitter, Instagram & Pinterest accounts - and the discount is yours. Here's the Facebook version - simply like or share it and post a comment to say that you’ve interacted and wish to take part in the promotion to receive your discount. You could bag a pencil drawn portrait for just £48 - take a look at the commission process and get me to work. And don't delay - the offer won't last forever! My old pal Ben Brown from Canyon Studios called me earlier this year and asked if I could contribute some artwork for an as-yet-unconfirmed event, hopefully featuring some of the biggest YouTubers in the world. Intrigued by the concept and excited at the mooted suggestion of a movie poster/fantasy-style illustration some way down the line, I agreed, and initially provided a two-point perspective watercolour rendering of the immersive environment around which the Hello World event would be based - used subsequently in much of the teaser material for the show. 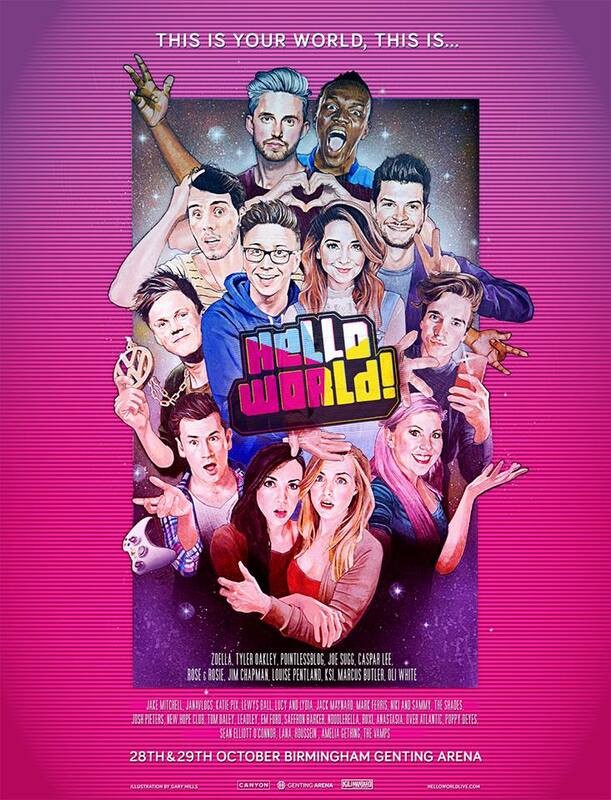 The go-ahead for the poster artwork - depicting Zoella, Tyler Oakley, PointlessBlog, Joe Sugg, Marcus Butler, Caspar Lee, KSI, Jim Chapman, Louise Pentland, Oli White, Rose Ellen Dix and Rosie Spaughton (actually barely half of all those appearing at the event) - was given in the summer, and has proven to be the biggest commercial piece I've undertaken so far in every regard. It's a physical painting (worth pointing out, as increasingly work of this approximate style is being rendered entirely digitally), done in acrylics & coloured pencils on gessoed board. The idea was to illustrate how a new frontier has been established in this realm of online media, and the interest it has already received has proven that whilst this still represents a relatively unchecked subgenre to many (millennials and above), the rising popularity of the subjects here is absolutely astonishing. 'Hello World' takes place next weekend (28th & 29th Oct) at the Birmingham Genting Arena, and will be huge. Many thanks to Ben Brown & Canyon (and a special shout out to Lacie Cox Photography for the shots of the final piece) - a joy and a privilege to work on. Delighted to announce some industry backup plus a little increased visibility for Gary Mills Fine Art. I've just become a member of The Association Of Illustrators - not an accreditation as such, more a statement of my intention to both adhere to professional industry standards and seek to protect my rights as an illustrator where the need arises. I've also made a submission to the NN Contemporary Artist Information Area (CV, artist's statement, prints etc), which is a resource for visitors & researchers to the gallery to peruse. NN, in case you didn't know, is Northampton's superb and esteemed art space, which is shortly to become an Arts Council England National Portfolio Organisation. They've both got nice logos too, as you can see. Illustration to mark the 2017 snap General Election, conceived in part with the necessity of encouraging people to actually bother to vote in mind (though this is a self-initiated piece, not a commission) - i.e. there's a lot at (Sturgeon's) stake, so let's try and make this interesting. In the event....well, I can't take *all* the credit for the depletion of the right wing vote. Really enjoyed getting my teeth into (ahem) a big ensemble piece, inspired by those great poster works by the likes of Putzu, Struzan & Amsel. Acrylics & coloured pencils on gessoed board. New artwork, the second in a series of football-themed illustrations (the first being Bobby) depicting Glenn Hoddle in his early/mid '80s Tottenham & England liveries. An exquisite player (one of a far-too-long list of English artisans unfathomably maligned within the domestic game) though latterly controversial manager & pundit. Acrylics & coloured pencils on gessoed board. The plan is to get some prints made of these - drop me a line if you'd be interested in one. Here it is. You're looking at it. Please continue to look at it and tell other people to look at it as well.